One of the biggest – and loudest – celebrations of the year, Bonfire Night takes place every year on 5th November, with the festivities sneaking into the closest weekend. Traditions include burning an effigy of Guy Fawkes (or some other figure of dislike) on a huge bonfire, and then setting off a myriad of fireworks to simulate the failure of the Gunpowder Plot of 1605. Loud noises and unexpected flashing lights upset many dogs, making this a particularly difficult time for anxious pups. Unlike thunder and lightning, fireworks don’t come with any warning signs! With a few simple tips and tricks, you can help your dog get through the evening comfortably – read on here to find out how. In 1605, thirteen young men, under the command of Robert Catesby, decided to blow up the Houses of Parliament in an act of extremism. The rebellious group was furious with James I’s Protestant rather than Catholic beliefs, and the subsequent treatment of Catholics in England at the time. With the intention of eradicating much of the royal family, these men placed 36 gunpowder-filled barrels in a cellar underneath the House of Lords. Guy Fawkes, known throughout history as the face of the Gunpowder Plot, was to set off the explosion. However, one of the men seemed to have had a change of heart and sent an anonymous letter to someone in the House of Lords. 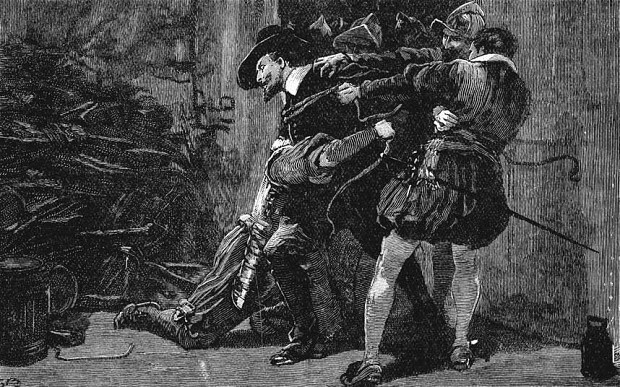 Fawkes, therefore, was arrested hours before he would have ignited the barrels. He was brutally tortured and then executed. Eventually, the rest of the group were also put to death. The whole affair shocked England to its core. Fawkes’ gruesome death was used as a warning to other rebellious Catholics, and he became a national bogeyman. Bonfires were put together and then set alight to celebrate the foiled attack, and we jovially continue this tradition today. What should I know about fireworks? Firework displays are the most important part of Bonfire Night tradition. These range from grand public spectacles to a few rockets and catherine wheels set off in the back garden. It’s a long-standing tradition to take the entire family to a display and watch children’s eyes light up in wonder. But fireworks are not toys; something that many people frequently forget. A&E reported that 4,506 people visited them from 2014-2015 for fireworks-related injuries, including burns, smoke inhalation and injuries to the eye. All fireworks, even sparklers, are dangerous explosives. Children should never hold a sparkler without gloves and should keep the firework at arm’s length. These sparkly little firecrackers look harmless but actually burn at the temperature of a welding torch. Always act responsibly when using all kinds of fireworks. Why might my dog become scared or anxious? While you and your family might look forward to Bonfire Night, your dog won’t be as keen. Close to 50% of dogs show signs of anxiety at the sound of fireworks. These can include hiding, trembling, destructive behaviour and seeking comfort. The end of October and the start of November is the loudest time of the year, as people celebrate not just Bonfire Night, but Halloween, Diwali and other festivals. This can lead to causes of anxiety other than fireworks, such as costumed strangers knocking on the door, flashes of light, loud music and unexpected crowds. Studies have shown two possible reasons for the way that dogs act at this time. Dogs who underwent a lot of changes and uncertainty as a puppy, such as a stressful move from the breeders or a traumatic noise-related event, are more likely to become scared of loud noises. Nonetheless, a newer study has demonstrated a link between fearfulness and breed: soft-coated wheaten terriers, for example, are far more likely to act anxious than pointers or boxers. 30% of female dogs and 72% of neutered dogs are also more likely to show signs of anxiety. How can I prepare my home for Bonfire Night? There are some simple things that you can do in the run up to Bonfire Night that will help your dog feel safe and secure. If your dog, however, experiences extreme anxiety on this night, consider travelling to a quieter location for the evening or taking your pup to an out-of-town pet-sitter. You can also discuss possible medications with your vet. Create a den so that your dog can retreat if they want to and fill it with comfy blankets and cushions. Try to include one of your old, unwashed t-shirts or jumpers so that the den also has your scent. If they do retreat on the night, make yourself available (stay in the same room) but otherwise leave them alone. Acclimatise your dog to the nerve-inducing sounds before Bonfire Night by playing a noise CD for a few nights prior to the big day. This way, the unusual noises of fireworks won’t come as so much of a shock. The Dog’s Trust has a free collection of sound therapy recordings for particularly anxious pups. Find out what’s happening in your neighbourhood. Ask neighbours whether they’ll be having a private party. Look up the times and locations of local fireworks shows. Remember, never take your dog to a firework show, even if they don’t appear to display negative reactions. Is there anything that I should do on the day itself? Make your home a quiet, private space for your dog. Close all windows and doors, board up any cat flaps, and draw the curtains in downstairs rooms. Put on the TV or radio to create a distraction, and be on hand with toys and treats to keep your dog entertained. Always try to make sure that there’s someone in the same room as your dog on Bonfire Night – they shouldn’t suffer alone. 35% more dogs go missing on 5th November than on any other evening, so you’ll need to be vigilant. Keep your dog in another room when answering the front door, and remember to check that their microchip is up-to-date. Feed your pup a nutritious meal before the fireworks start, in case they become too anxious to eat, leaving plenty of time for a walk. If their behaviour is worse than usual, don’t give out punishments: they’re not acting out, but frightened. Cuddle and comfort them if they’re receptive to touch. Most importantly, act normally – your dog is smart and will pick up on any odd behaviour. Bonfire Night should be enjoyable evening for all the family. By making your home safe, snug and secure, you’ll ensure that your dog doesn’t remember the night with fear. And don’t forget! If you’re going to be out for the festivities, leave out some tasty Lovejoys Hypoallergenic dog food for your pup to keep their energy levels up for your return.